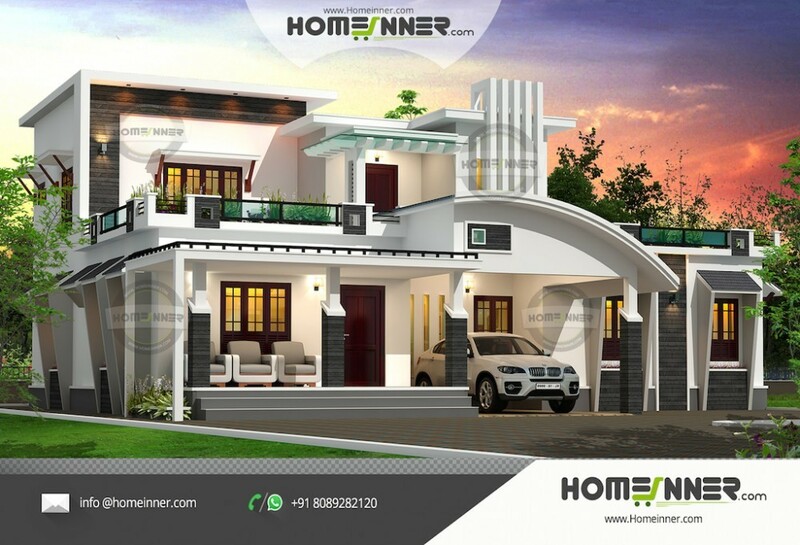 This Luxury 3200 sqft 4 bhk Modern Indian Villa Design has a very attractive exterior design with beautiful verandha in the front and a luxury touch to the exterior.This home design has the following specifications. This home has a very special interior plan.The main entrance leads to the family living area.A separate dining room is given.A prayer room is also in ground floor. Also a spacious kitchen with work area and a common toilet from outside is in the ground floor.There are three bedrooms with attached dressing room and bath in the ground floor. First floor has one bedroom with attached bathrooms, and an upper living area.The front balcony is provided with open terrace. If you like this House design idea theme - "HIND-1110" , do take few seconds to share with your friends and relatives . Let them know what you like.